The Cohiba event we had last Thursday night to kick off Memorial Day weekend was one of the most successful we’ve had in a while. We mixed up our usual event formula some, and the result was a lot of people having a very good time at the corner of De Lacey and Green. I mention the street because the crowd poured out of the shop and outside, partly for a little elbow room, and partly because it was a beautiful spring night. The weather was certainly one of the reasons it was Standing Room Only out in front of the shop. The one really new element we introduced – live music – was certainly one reason for the evening’s success. It gave the shop a different vibe, cool yet energized, and, I noticed, got people to stick around longer than they usually do at our events. I know that some people did come because they were curious about the music. They were all very pleasantly surprised with what they heard. We’re soon to be the first cigar shop hosting a wedding. We could also be the first cigar shop to have its own house band, the CxC Jazz Trio. 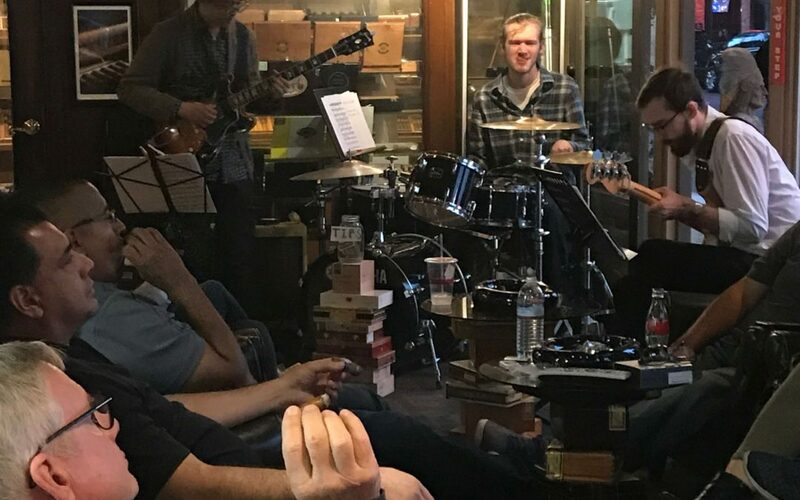 The three young men were on guitar, electric bass and drums – and both the drummer and I were very happy to discover how well the drum set fit into the corner next to the humidor. Our musicians found just the right material and the right volume to play at: loud enough to be heard and enjoyed, but not so loud as to get in the way of conversation. I liked them so much that I suggested that, next time, maybe they could do a set with the volume up a little more, so that everyone could sit back and listen to them for a few minutes. I’m trying to think of a song I’d like to hear that way. The guys will be back soon, and we’ll announce their next appearance on the website as soon as it’s set. In the interim, I want to add that they’re available for all kinds of gigs – so contact me if you want to reach them. I think they even do weddings and bar mitzvahs. The evening also featured a lovely addition to our already lovely corps of Cigars by Chivas hostesses, who was responsible for such liquid refreshment as we had on offer. From my standpoint, I know the evening was a success. Our $10 robustos sold out, and, in fact, our whole Cohiba stock got cleaned out. 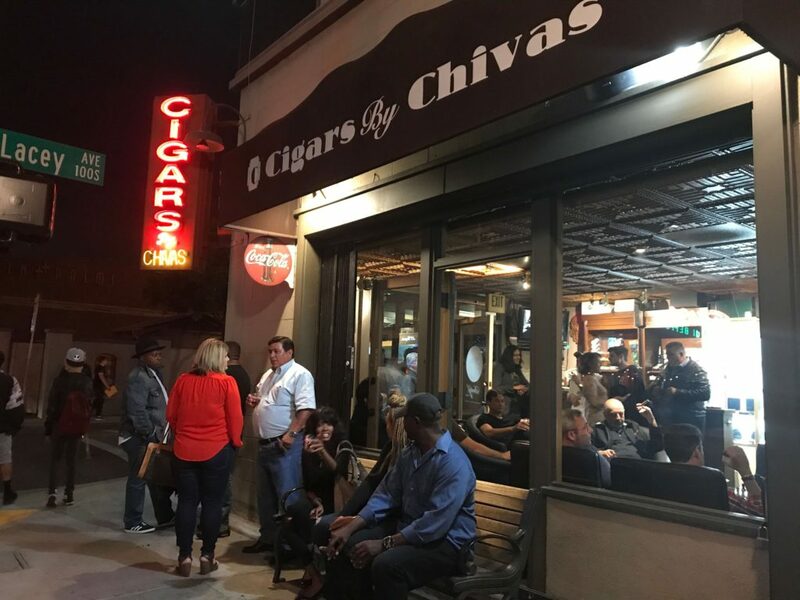 It wouldn’t be a good time at Cigars by Chivas without good cigars, and those we had with the featured Cohiba Blues. We all had quite a time. I hope you enjoyed it if you were here. If you missed it, be sure to join us at the shop the next time the CxC Trio is playing. A good cigar goes damn well with good music.